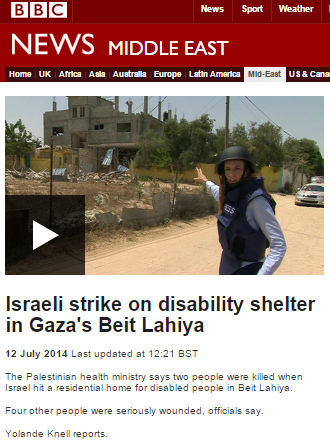 On July 12th 2014 the BBC produced four separate reports which included descriptions of an incident in which two women were killed in Bet Lahiya in what was described as an Israeli airstrike on a shelter for disabled people. 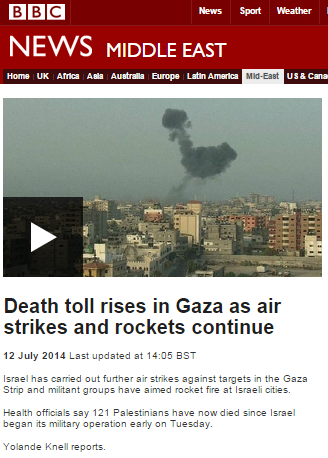 “Israel and militants trade fire as Gaza toll rises” – BBC News website, July 12th. “Israeli strike on disability shelter in Gaza’s Beit Lahiya” – Yolande Knell, BBC News website and BBC television news, July 12th. “Death toll rises in Gaza as air strikes and rockets continue” – Yolande Knell, BBC News website and BBC television news, July 12th. “Meanwhile, in the north of the Gaza Strip, another body is discovered. This was a severely disabled woman; one of several residents at a shelter. Just after dawn it was hit by Israeli war planes. This crater is where the missile landed. Neighbours heard a big explosion. Neighbour: We were very surprised this centre was hit. We expect the Israelis to bomb places linked to the militants. Here there were disabled people unable to move. 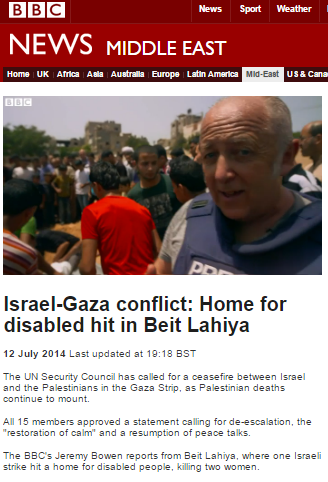 “Israel-Gaza conflict: Home for disabled hit in Beit Lahiya” – Jeremy Bowen, BBC News website and BBC television news, July 12th. “Suha’s brother Yussef waited for her to be prepared for her funeral. He took us to see her body. Yussuf rejected Israel’s claims that it tries hard not to kill civilians. “According to correspondence and reports from various NGOs, on 12 July 2014, two women were killed and four others injured as a result of an IDF aerial strike on a care centre for the mentally and physically disabled, belonging to the ‘Alambra Association’, in Beit Lehia. As a result, and in accordance with the MAG’s investigation policy, it was decided to refer the incident for examination by the FFAM [Fact Finding Assessment Mechanism – Ed.]. According to the factual findings and materials collated by the FFAM and presented to the MAG, the strike was directed at a weapons depot located inside the residential home of a senior Hamas commander, in a building comprising of four apartments. While the operating forces were aware of the existence of a kindergarten in the same building, close to the weapons depot, there was no information indicating the existence of a care center. Prior to the attack a number of precautionary measures were undertaken in order to minimize potential civilian harm – including several attempts to telephone the residents of the building and the firing of two warning projectiles towards the structure (as part of the ‘knock on the roof’ procedure). No reaction was identified by the residents, and no presence of persons at the site was discerned prior to the attack. As an additional precaution, the attack was carried out late at night, in order to avoid any possible harm to children attending the kindergarten during the day. The findings further indicated that at the time the attack was decided upon, the operational assessment concluded that, as none of the precautionary measures resulted in any response, no civilians were present and no civilians were expected to be harmed as a result of the attack. In light of these factual findings, the MAG found that the targeting process followed in this case accorded with Israeli domestic law and international law requirements. The attack was directed against a military objective, while adhering to the requirements of the principle of proportionality, and the decision to attack was made by the authorities authorized to do so. Further, the MAG found that the attack was carried out after a number of precautions were undertaken intended to minimize the potential for civilian harm, and that the professional assessment at the time of the attack – that civilians would not be harmed as a result of the attack – was not unreasonable under the circumstances. Although seemingly civilians were harmed as a result of the attack, this is indeed a regrettable result, but it does not affect its legality post facto. It is of course highly unlikely that we will see the BBC going to the trouble to inform all the many members of its audiences across various platforms who were mistakenly led to believe that Israeli forces had deliberately attacked a home for the disabled that the real reason that building was targeted was because Hamas had placed a weapons store in the same building as a kindergarten and a centre for disabled people. However, those four inaccurate reports remain on the BBC News website and now form part of the corporation’s “historical records”. As readers may recall, the BBC announced in June that its archive content is subject to editorial guidelines and may be the topic of complaints. One would therefore now expect to see clarifications attached to all the above reports – if only to prevent an unnecessary waste of public funding in dealing with any such complaints. Actually that is correct because that means Hamas should be protecting civilians from harms way, just like Israel was dong to it’s citizens. Israel did what they were required under international law whereas Hamas didn’t. Medias and ngos who give false informations should be banned from Israel at least until they amend their incorrect and uncontroled informations. If the fact is repeated they should be banned for ever!